Original study of 20th C British comic double acts – their historic, social & cultural origins, heyday & decline – from Victorian seaside minstrels, through between the wars cross-talk duos on stage & wireless to the huge appeal of iconic TV pairings. Brief & telling glimpses of scores of acts, with in-depth scrutiny of the more famous ‘turns’. In this compact and original study of British comic double acts, Eric Midwinter cheerfully attempts to answer three questions. First, and while describing the birth of the modern double act among the minstrel shows at late Victorian seaside resorts, he wonders why there were so few double acts before the end of the First World War in 1918. He explains how cultural and even legal reasons curtailed the growth of the phenomenon. Second, he asks why, then, there was such a profusion of double acts between about 1920 and the mid-1950s. He shows how the dictates of fashion, coupled with the demands of variety and ‘wireless’, created a boom time for the crosstalk comics. Third, he inquires into the reasons why, since that point, and with the intriguing exception of Morecambe and Wise, there have been so few comic duos. He analyses the effects of television and other social dimensions on popular entertainment by way of explanation. Throughout there are brief and telling glimpses of scores of double acts, including some American examples, together with in-depth scrutiny of the more famous ‘turns’, such as Laurel and Hardy, Flanagan and Allen, Murray and Mooney and Jewel and Warriss…and all related vividly to the social background of their audiences. At once knowledgeable and readable, I Say, I Say, I Say is an attractively presented account of a measurable and significant element of popular entertainment over the last hundred or so years. 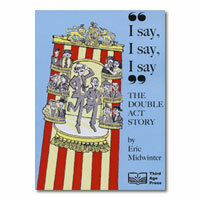 Everyone has enjoyed a double act – the appeal of I Say, I Say, I Say is very general indeed.